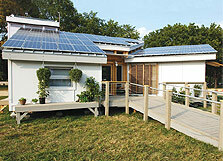 The 2002 Solar Decathlon champions wanted to show that solar technology can be used in any home. Click drawing to view a larger image. We want people to realize that solar design can look good and doesn't need to be the dated designs we all remember from the '70s. The 2002 University of Colorado team had one goal in mind from the very first day of their Solar Decathlon experience. They wanted to prove that solar energy could work in just about any house. They intentionally designed their house to be more like an everyday American home than a perfectly designed experimental solar house. The result of the CU Boulder design approach was a "beautiful house that also happened to be highly efficient and solar-powered," said team member Matthew Henry. To get there, the team decided to break one of the so-called "must-have" solar design principles — the roof is not at the perfect angle for the solar cells. In fact, a guiding principle of the CU team was public access and acceptance rather than maximum solar energy production. The team recognized early on that their corner lot on the National Mall site gave them a unique opportunity and decided to orient the house more to the pedestrians passing by than to the sun. Another guiding principle for this team was that everything in their house is commercially available and mass-produced. In fact, the home was built on location at a local Home Depot. The CU team not only designed and built a new solar home, they might also have created an entirely new way to build houses. Called the BASE+ concept, the CU approach focuses on being able to easily adapt the building to any building site. According to the CU team, BASE+, which stands for Building A Sustainable Environment, is an adaptable construction methodology for repeatable, site-specific housing that showcases renewable energy systems and environmentally sound building products. Simply put, the BASE+ approach would allow consumers to build a house on just about any site while incorporating solar energy and energy efficiency. There are three components in the BASE+ system: the basic, spec, and core modules. By combining these modules in different ways, consumers and builders can accommodate varying budgets, climates, and building sites without sacrificing visual appeal.